Before remodeling your home, consider the cost versus the value, especially if you plan on listing it for sale anytime soon. I’ve seen many renovations where a lot of money was spent and not recouped when it comes time to sell. 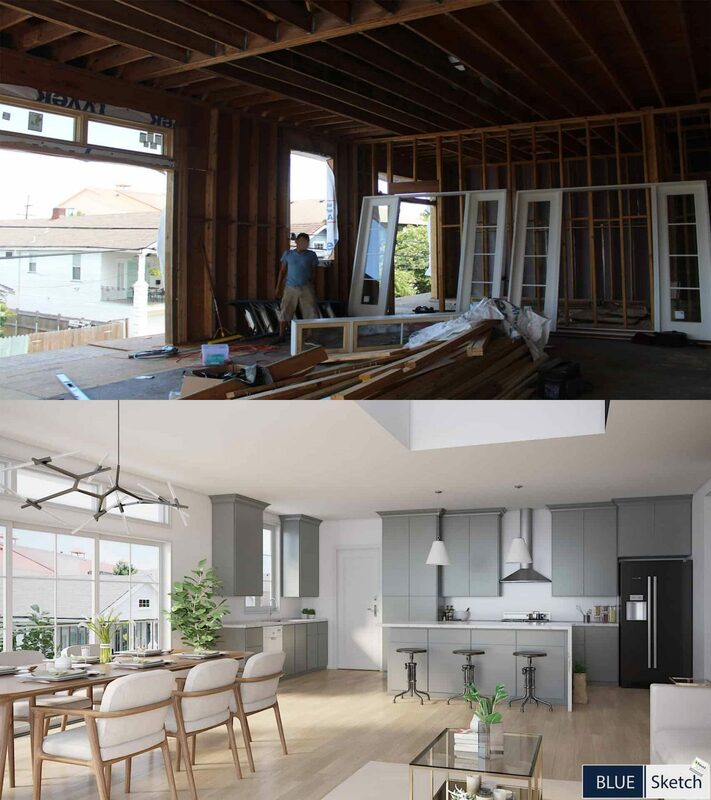 To the get the maximum value for your dollar when doing home renovations, there some important things to keep in mind so that when it comes time to sell, you can command a higher price. The follow remodeling ideas come from my years of selling homes and seeing which renovations provide the most value before hitting the market for sale. You get one chance to make a good first impression. The curb appeal of your home is so important when preparing to sell your home. A good first impression will not only add 5% to its value (according to market data), but will also bring more buyers. Curb appeal includes exterior paint, manicured and watered lawn, plants, shrubs, flowers, etc. If you have a deck, add some nice furniture, or create a colorful garden with planters. I have worked with the best landscapers who can help freshen up your landscaping if you don’t want to spend a lot of money, but still make it look at its best before we take photographs. One of the easiest and least expensive options to freshening up a house before listing it for sale is paint! Over the last 15 years there have been a lot of DIY shows using paint for accent walls and they usually looked really good on TV, but unfortunately, some people take it a little too far either with colors that don’t match, or too dark so it makes the room seem really small. I’ve had a team of painters come into a house to re-paint in neutral tones and completely changed the look and feel of the home. The spaces looked completely amazing and much larger than they did before and made a huge difference when we photographed the home. I have a team that can take care of choosing the right color palette and painters to get it done quickly and at an affordable price. Kitchen remodel is probably the best remodel to add value, but can also be the most expensive. Most homes that have not had kitchens remodeled since 1995 need updating. If you are getting ready to sell, I do not suggest using the best materials, but save money through either refacing cabinets, replacing countertops or painting. I have seen a lot of objections to homes due to olderappliances, even if they are top of the line, buyers are concerned that they will have to replace them after moving in. You don’t necessarily need to replace them all, but this can be a great point of negotiation if the buyers bring it up as a concern and their offer reflects the concern. We can also provide virtual renditions prior to remodel if you need to list it immediately, but the work hasn’t been completed. Bathrooms are the second objection I’ve seen with buyers. Most homes that have not been remodeled since 1995 are due for a bathroom remodel which can be a very affordable project if you choose the right materials and contractor. The single most important bathroom in the house is the master bathroom. I’ve seen a lot of buyers walk away because of outdated master baths, and a lot of buyers aren’t willing to take on the project unless the house is discounted. Again, some inexpensive options may be refacing cabinets, counter tops, fixtures and Paint. With more companies giving employees the option to telecommute, a home office can really add some value to a home. If you have some extra space in your home, consider converting it into a home office. Make sure there is plenty of work space and it is staged appropriately so buyers don’t have to envision it themselves. If staging isn’t an option I can always virtually stage it and have those renderings hanging on the walls in the house for buyers to see. It has been determined that when you spend the money to add a deck onto your home, you will likely be able to recoup more than eighty percent of its cost at sale time. If you choose to install a deck, take some time to plan it out and come up with unique features such as built in benches or a fire pit.. Use higher grade materials to increase the life of the deck and buyers will appreciate that you spent a little extra money so that they don’t have to maintain it every year with sanding and staining. If you don’t have enough space to add a room to your home, consider finishing your basement. A basement space can easily be turned into a playroom for the kids, a bar, or media room. Adding a bathroom and bedrooms to your basement remodel will always increase the value of your house, but remember that basement remodeling sometimes only returns 60% of the amount spent. It might make more sense to do it now if you’re not thinking about listing your home for a couple of years so that your family gets to enjoy the space; and when it comes time to sell you’re going to get more money for your home. Too much furniture and knick knacks in a home can be a detriment before listing your home. I offer my clients Crate & Store through Johnson Storage & Moving. They will drop off multiple 5x7x7 containers, we fill them up, and they store them in a climate controlled warehouse until they are ready to be delivered to your next home. My stagers are fantastic at seeing what needs to go and what needs to stay to add maximum appeal to buyers when they first see your home. There are many remodeling/staging options that can be done to your home home to increase the value and solicit more interested buyers in addition to the the ideas listed above. If you take the time to plan and don’t overspend, we can make sure we get maximum value for your home through increased buyer interest and multiple competing offers….and this is where I shine as a Realtor; going the extra mile for my clients to ensure their satisfaction once their home has sold and that they know I worked hard to get their home sold for the best and highest possible price. It's free. Stay up to date with the latest real estate trends in the Denver Metro area. We respect your privacy and will never share your email address with anyone. "Our unit, considered a luxury sale, we knew would take a realtor with a broad base of clientele... You had the unit sold within a few weeks. You are so professional yet so personable, I feel we will be friends for life! " I am an Innovative Luxury Home Marketing Specialist; Selling & Leasing Luxury Homes in the Denver Metro area since 2008. My clients appreciate my unparalleled customer service and cutting edge marketing tools using 3D Virtual Tours, Aerials and Global Syndication sites; all of which bring more visibility and buyers to my client's Luxury Home listings. Call me to experience a level of professionalism unmatched by any other Realtor!